traditional and modern. With the Brass group, recorders and voices, there was a wonderful spirit shared. 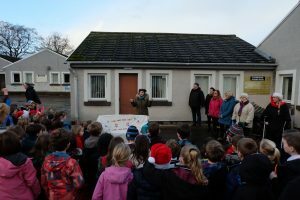 Despite the chilly air, we all walked back to school in time for another gathering. This time everyone gathering outside. 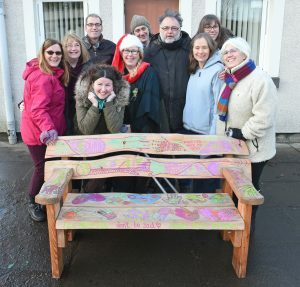 With PTA represented by Mona and Gill and Parent Council members represented by Ralph, Jim, Sara, Neill, Loreen and Chair, Carol – and Lynn, without whom we would not have such a wonderful, unique and special buddy bench. 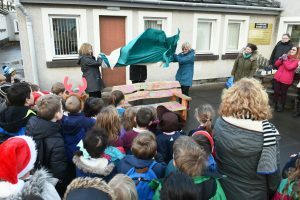 Lynn thanked all the pupils from P1 – P7 who worked together with Lynn (and her glamorous assistants, Jim and Loreen), to share ideas and then work on the art itself. The ideas were wonderful and it was a very special time to share with the pupils who flocked to help. And so, to the BIG RE-VEAL. 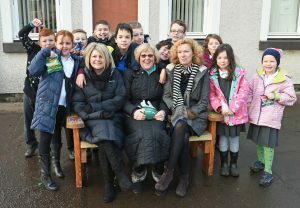 The Parent Council invited former Head Teacher Mary McCall back to the school to complete the 40th Anniversary work and make sure we have a photo of both Mary and new Head Nicola together on the bench. This means that 6 of the 8 Head Teachers of PPS at the Glebe have been photographed together on the bench. 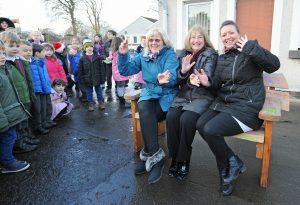 Mary McCall and Sheila Donaldson were VIPs on the day – to celebrate both their careers at Pencaitland Primary. 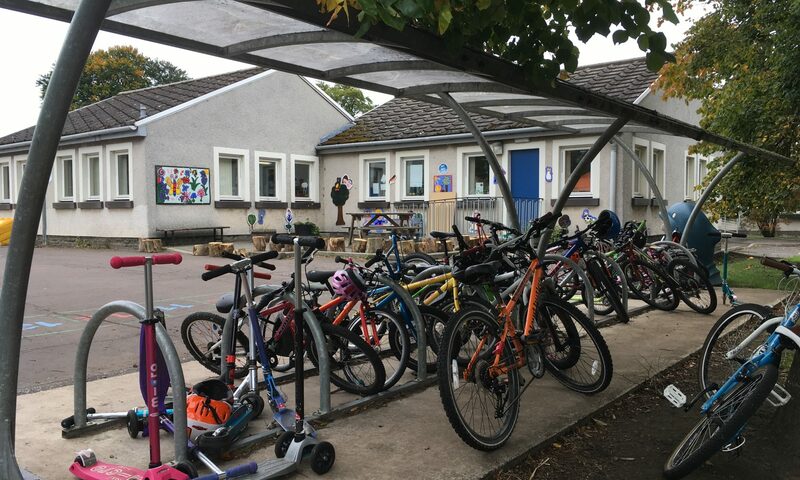 Sheila left the school the following day, after 15 1/2 years in PPS. 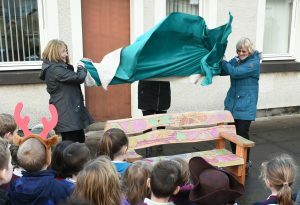 With pleasure – and great flourish…. .
the bench, in all it’s new glory, was revealed. 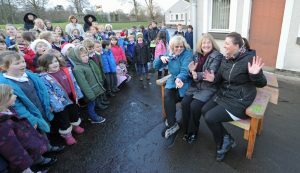 Applause and singing together rung out as Carol, PC Chair, led the children into “Holly Jolly Christmas” – the song learnt and performed for Forth FM as a little photoshoot took place right before Morning Break. Grown ups need buddies too…. Friendships are very real to all of us. 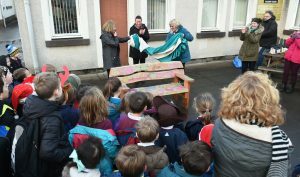 The pupils were delighted to see the bench back in the playground and the y were quick to enjoy spreading the happiness with friends of all ages. With this many happy faces, it’s bound to be a great place to find a friend. 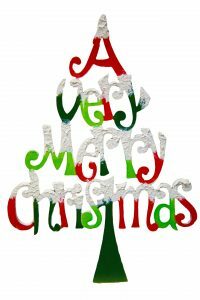 So all that remains for the Parent Council to say now, is to wish all a happy festive season and a wonderful 2017 – and ….